Originally published 4-26-11 as an SMB Group research brief in .pdf format, available here. When big companies gobble up smaller ones, you always wonder whether the acquired company will get swallowed up into the belly of the beast, derailed or morphed into something unrecognizable. Fortunately, it looks as if Dell is helping Boomi stay the integration course, as we learned in a recent update on the progress of the Dell-Boomi acquisition. In this brief, we provide a brief overview of what Boomi is and what it does, highlights of its new Spring 2011 release, and our perspective on how the Dell-Boomi acquisition is shaping up. What is Boomi and How Does it Work? 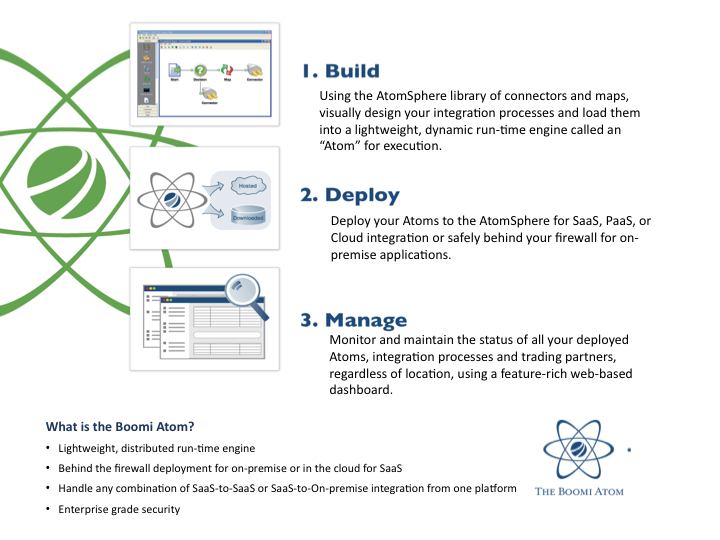 Boomi gives companies of all sizes a one-stop shop where they can integrate any combination of SaaS and on-premise applications, and third-party trading partners via Boomi’s AtomSphere integration cloud. Sign up for an account and begin building integrations immediately for free. Boomi provides a free Trial via the Web, and users can develop the integration without paying a fee. Once they deploy the integration, users pay for it with monthly subscription pricing. Create integrations without programmers. Based on user feedback, Boomi has redesigned the user interface a couple of times over the years to make it user-friendly for the likes of systems analysts, advanced CRM administrators, or those with report-writing and business intelligence skills. Choose where they want to run their Boomi integrations. Users can have Boomi run their self-contained, autonomous “Boomi atom” integrations in a public cloud, or in a private cloud or on-premise behind their own firewalls. But, while users choose where they run their Boomi atoms, these atoms always connect back to Boomi’s data center for centralized management, updates, etc. via the AtomSphere cloud. Build and/or use pre-built integration widgets. Boomi and its partners also provide pre-packaged integrations in ready-to-run wizards that business users can deploy. ISV partners typically build these widgets and bundle them with their applications. The widgets contain the application connectors plus the data mappings and transformation logic, and feature wizards to walk end-users through the integration in a step-by-step fashion. For example, Taleo has built Boomi a widget for Workday to ADP integrations. Use the Boomi dashboard to monitor the status and health of all of their integrations, and provide an audit trail. As important, Boomi doesn’t impose any additional security concerns for users. 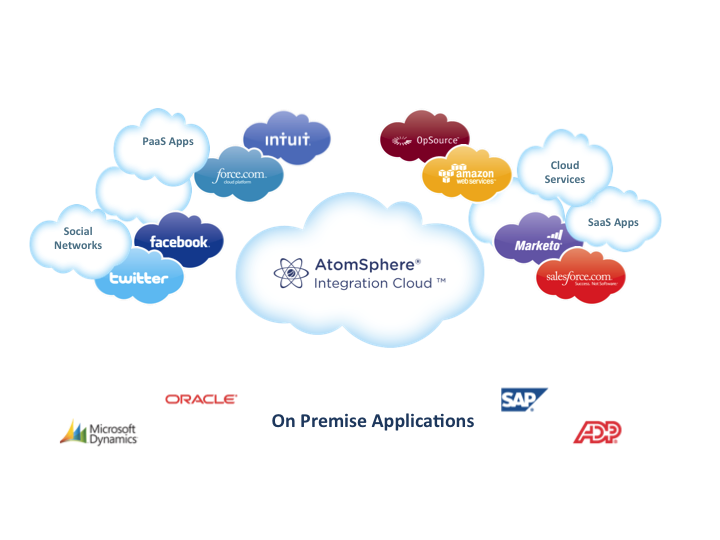 When customers deploy the atom behind their firewall no data passes through AtomSphere. AtomSphere only monitors the health and status of the atom—the data only flows directly between the applications being integrated. Community is another significant part of Boomi’s value-add. The Boomi dashboard features a green feedback button, and Boomi implements at least 25% of the top-vote getters each quarter. In addition, Boomi Suggest aggregates integration maps (over 15,000 live maps to date) from users. When another user has a similar integration requirement, Boomi Suggest generates automated mapping guidance that typically provides about 80% of the data mapping required—cutting time and cost from the most time-consuming part of creating an integration. The Boomi ecosystem also houses public and private connector communities, so that once someone builds a connector, they can share it. Boomi provides a revenue share arrangement for companies that build public connectors and widgets. 1. Providing additional connectivity to legacy middleware, such as IBM MQSeries, Tibco, webMethods, Progress, etc. to make it easier for companies to connect Boomi integrations with their on-premise integration services, enabling them to more easily connect existing integrations and applications to SaaS and cloud applications. 2. Supporting simpler, faster processing for large data sets. This enhancement simplifies data migration, and includes automatic support for Salesforce.com’s bulk API, designed for organizations that need to load large amounts of data into Salesforce.com. Instead of dealing with Salesforce.com’s complex API directly, Boomi users simply check a box, and the tool calculates the optimal batch size for loading. 3. Anywhere integration monitoring. With the advent of cloud computing, applications and data are increasingly distributed across many different locations, networks and corporate boundaries. Boomi atoms enable users to distribute integration capabilities to these disparate data sources, without sacrificing centralized monitoring and management across integrations. Boomi has also added a new API so that users can connect Boomi to third-party monitoring, such as Dell OpenManage. 4. New partner support programs. Boomi has introduced a 4-day hands-on boot camp for integration practitioners, as well as a new 3-level partner certification program to promote consistent service quality across the partner ecosystem. While some of these enhancements focus on large companies, they also make it easier for ISVs and SIs to develop, monitor and manage widgets and integration services for their SMB customers. As noted in the SMB Group’s 2011 SMB Top Ten Technology Trends, cloud computing and software-as-a-service (SaaS) have taken IT cost and complexity out of deploying business solutions, making it easier for SMBs to deploy applications to help run their businesses more effectively. While some vendors provide integrated business suites, most companies run a mix of on-premise and cloud applications from different vendors. For instance, they may use Intuit QuickBooks, a Sage or Microsoft solution for back-office accounting and ERP needs, Salesforce.com for CRM, and other cloud applications for marketing or HR. But they often lack the time, money or appetite to integrate these applications. When applications don’t “talk to each other” businesses waste a lot of time re-entering redundant data and reconciling inconsistent and inaccurate information across key workflows, such as order to cash. At the same time, the volume of data that SMBs must manage is growing exponentially–adding to the integration challenge. Streamlining connectivity between internal applications and with third-party applications and processes. Reducing the time, errors and business costs associated with inaccurate data entry. Providing a consistent, real-time view of information across integrated applications. When ISVs or integrators offer SMBs a short cut to integrate applications with those of relevant partners, they help remove adoption barriers and enable SMBs to get more value out of their business applications with less hassle. Hosted by Dell’s SMB Group (and also working closely with Dell’s Services team), Boomi has retained its offices and independence in Philadelphia and San Francisco. Dell has put a corporate integration executive in place to help smooth the transition, and is investing to double Boomi’s staff by the end of 2011. However, Boomi continues to gear its offerings for enterprises of all sizes, with revenues evenly split between large enterprise and SMBs. For instance, Mindjet, which has about 250 employees, wanted to standardize its business application integrations to minimize ongoing technical support requirements, and support Sarbanes-Oxley compliance. The company was able to create its first integration in 5 weeks, without using any internal IT resources, is using Boomi’s centralized management and data auditing capabilities to comply with Sarbanes-Oxley, and is adding additional integrations. About 75% of Boomi’s are channel influenced. Boomi has grown its ISV and SI partner roster to 70+ companies. As discussed earlier, partners can build widgets and deliver them to customers as a packaged integration. Boomi estimates that about ½ of its ISV partners build widgets, and each typically creates about 3 to 5 of them. In addition, there are about 15, 000 live data maps in Boomi Suggest and about 200 connectors in Boomi communities. The integration challenge has always been complex, and continues to become more multifaceted. More applications need to be integrated both in the cloud and on-premise. In addition, adoption of new mobile and social media solutions is on the rise. Six months into the acquisition, Dell’s approach appears to be on target. Boomi has stayed focused on its mission of helping companies overcome one of the major hurdles to adopting new cloud-based solutions—without having the burdens of raising capital or fielding questions about financial viability. As a result, Boomi’s growth curve is accelerating. Although some of the Spring 2011 enhancements seem most appropriate for larger customers, they should also help ISVs ease integration issues for SMBs in a more scalable manner. In many cases, SMBs often lack the skills or resources for do-it-yourself integrations, and pre-built connectors and widgets from ISVs are a much better fit. Looking ahead, while Dell and Boomi indicate they will continue to nurture this channel-friendly, community-centric strategy, Dell is starting to train its own sales, services and specialist teams on Boomi. Although the Dell-Boomi offering faces strong competition in the integration arena from the likes of IBM-Cast Iron, Informatica and Pervasive, Dell teams should provide Boomi with a strong sales boost among both end-users and partners, especially if Dell can leverage Boomi out to its worldwide teams to take advantage of global opportunities. Overall, Boomi’s cloud integration solution is a good fit with Dell’s expanding cloud computing strategy. As important, Dell’s corporate integration approach appears to be off to a good start to providing the combination of nurturing and autonomy that will help Boomi thrive and optimize the value it can deliver to Dell, its partners and customers. Previous Previous post: Is There a Method to Social Media Madness?